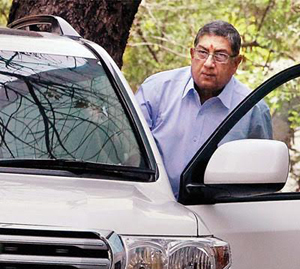 Subrahmanya, June 15, 2015: BCCI former chief and current International Cricket council chairman N Srinivasan paid a visit at Subrahmanya temple on Saturday. Sources say that, Srinivasan arrived to the Subrahmanya temple at late night on Saturday and stayed in a private guest house near Kumaradhara Bridge. Srivasan would be performing ’Sarpa Samskara’ and ’Ashlesha Bali Seve’ as instructed by his astrologer from Kerala and will be staying here for two days. He was forced to step down from BCCI president’s post. Many big leaders, politicians offer Pooja at Kukke Subramanya temple. Kukke temple has emerged as the richest government run temple in Karnataka.